Today's post features all the yummy eats I enjoyed yesterday. My food and drinks started off for the day a little unusual as I was taking a cortisol/hormone panel test (DUTCH test) and I couldn't eat or drink the first two hours of the morning. We are adding this test to our services at Nourishing Minds Nutrition, and Meg and I prefer to complete the tests on ourselves before we recommend them to clients. Its important to me to understand and experience the tests so I can better communicate and educate my clients on how to take them. It was a VERY easy test to take and I'm excited to start giving them to clients now! We have 1/2 off a couple of these tests left, so if you've been thinking you want to be a client in our practice and working on adrenal fatigue/hormone regulation this would be a great opportunity to do that! Email me at thediehardfoodie@gmail.com! Okay so once I could finally eat I had Jacked Up Java and tha BEST breakfast. 3 slices Niman Ranch pepper bacon (so good) + whole small avocado + roasted potatoes heated up in the leftover bacon fat. This held me over for a long time and ended up eating a late small lunch. Tuna + avocado oil mayo + mustard + olives and a large handful or two of almonds. 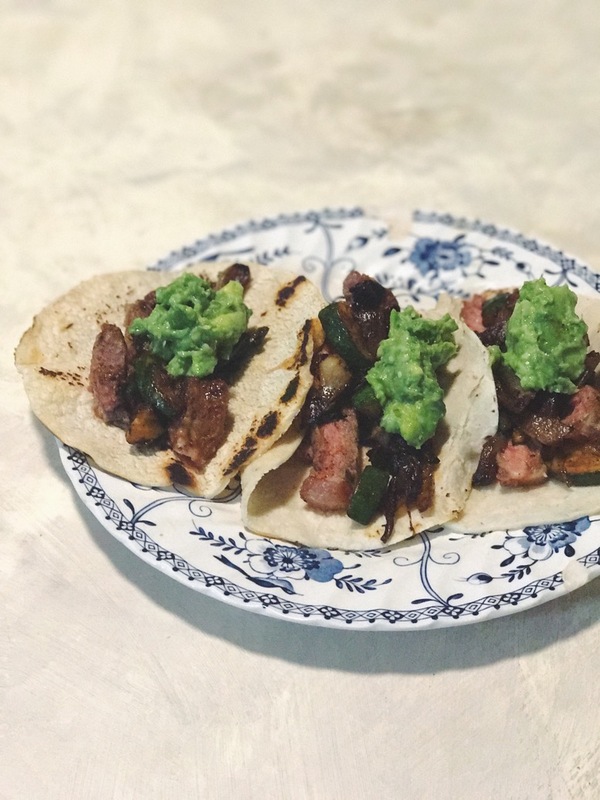 For dinner I made steak tacos with corn tortillas, sauteed onions and zucchini, steak and homemade guac. I sauteed the steak (got from Butcher Box, LOVING their meat) in grass fed butter with the onions and zucchini and added a lot of chili spice and cumin seeds. And then I layered all these goodies in the tortillas and devoured! So easy yet so yummy. Dessert was a ton of cantaloupe and that's it for this particular day! Tell me: What's something super delish you ate yesterday?